Let's embark on the most trilling Grand Adventure - a speed-boat ride through the rapids of the lower Iguazu River to the bottom of the falls. The fourth circuit covers the St. Martin Island (Isla San Martin). Situated in the heart of the falls it offers the spectacular view on the St. Martin Fall (2nd largest after Devil’s Throat). From its southern tip you can also see the Rivadavia and Escondido Falls. The visual effects are greatly magnified by the “lenses” of a huge natural rock arch through which the falls are visible. 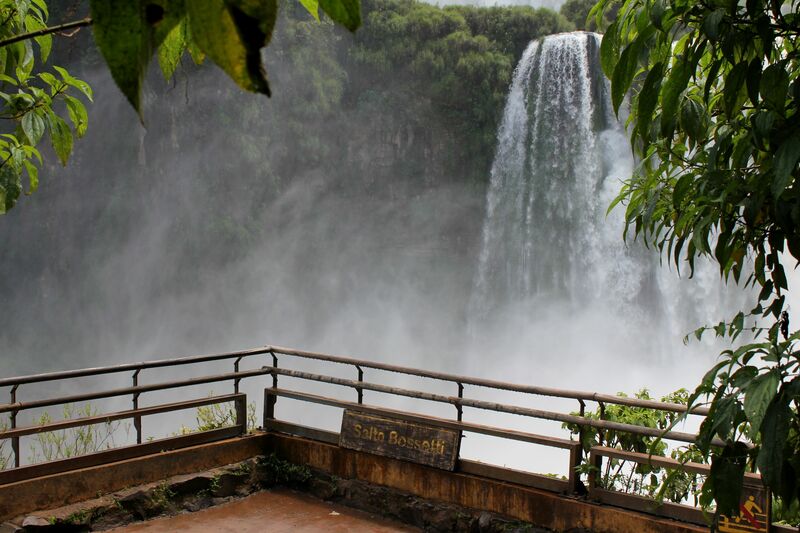 It is worth to remember that the area of Iguazu Waterfalls belongs to the subtropical climate. The best time for visits is spring and fall. Local summer (northern hemisphere’s winter) is very hot and humid taking out a big chunk of pleasure from otherwise memorable visit. It compensates however these “small inconveniences” by the fact that the season from November trough March is rainy. The high volume of the flowing water offers the most stunning spectacles with thunderous sounds, clouds of mist and amazing shows of rainbows. View on the waterfalls from the Lower Circuit (Circuito Inferior) platform. On the other hand the local winter (our summer) is traditionally a period of lower level of water significantly diminishing the waterfalls’ effects we are coming to see in the first place. Views along the Lower Circuit platform on the Argentinean side of waterfalls. Climbing up the Lower Circuit brings stunning vistas on the waterfalls and surrounding them vegetation. Grand Adventure is a trilling speed-boat ride through the rapids of the lower Iguazu River into the bottom of the falls – Three Musketeers (on the Brasilian side) and Salto Mbigua on the Argentinean side. 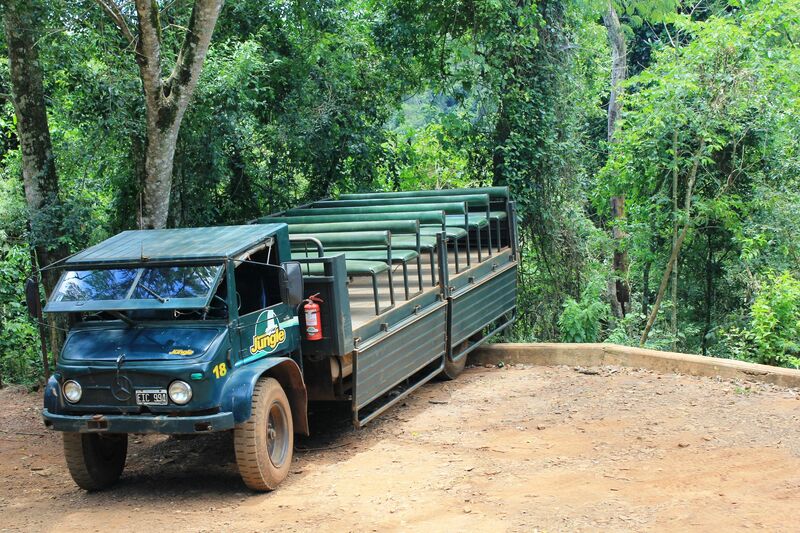 The Grand Adventure starts on 4-wheels with the ride through the rain-forest of the Parque National Iguacu. It all starts with the 4-wheel drive “Hummer-on steroids-like” vehicle taking you on the dirt road called Sendero Yacaratia across the rain forest down to the lower Iguassu River. Although this almost 8 km trail is also open for trekking, we did not see anybody on the way. Instead, in the silence disturbed only by the car’s engine and from time to time by comments of our guide, we could watch with amazement the surrounding wilderness…… You will see strange trees dotted with epiphytes and if you are lucky you can spot beautifully colored toucans (at least it happened to me). The 4x4 drive ends at Puerto Macuco – an embarkation point for the speed-boats. From time to time you will have to clean your lenses from the spray of zillions of little droplets, but that is pretty much all in terms of being in the direct contact with the water. The boat is circling bumpy waters along the cascades while everyone is shooting “all you can see”. Definitely down there, there is a huge temptation to memorize these indescribable scenes despite the fact that the rough waters and “multiple” hands raising cameras in front of your nose in a search for the best view can make it quite difficult if not hopeless. But do not give up easily – it is part of the deal and for sure that is why you are down there. For sure this is the place where you keep widely open eyes and shutters as well…. The second phase starts with the captain’s command to put “all you can” into the big waterproof bags distributed at the beginning of the boat’s ride (watch when everybody is putting their “stuff” away because the warning is in Spanish!). This mainly includes your electronics (cameras, phones etc…), watches (if not water-proof), but do not forget about documents, “stuffed” wallets and of course paper money or if you wish – bills (unless you want to get into the money laundering process what unintentionally happened to me). You may also consider protecting your shoes from being soaked with water – the rest, like T-shirts and short-pants will dry-up sooner than you may think (keep in mind that this is a subtropical climate). And forget the raincoat – you will get wet no matter what! Once everybody is ready, the captain steers the boat at so close distance from the wall of falling water that you are becoming “truly personal” with it. For me it was a kind of “equilibristic” achievement to keep the boat at the touch of hand from the thundering water. Engine and captain’s skills versus the fully wild, unhampered power of plummeting water, seemingly unpredictable river’s turbulences and clouds of mist obstructing the visibility. And from time to time torrential-like showers fall straight on your head…. but honestly that is what the Grand Adventure is about. Do not worry – it is safe (never heard of any accident), but for sure you will get totally wet from the head down to the toes. I’m sure that your level of adrenaline will considerably go up during this short boat trip – trip that definitely deserves the name “Grand Adventure”. For many it will be one of those unique, mind-blowing lifetime experiences, an adventure that you will keep in your memories forever. For sure however, while these Free Iguazu Waterfalls Pictures and written info can give you some ideas about what is the Grand Adventure Tour, in reality nothing can replace the real experience of being there, in the middle of the “Perfect Storm”…. The visual effects are greatly magnified by the “lenses” of a huge natural rock arch through which the falls are visible.